After 18 months and many unsuccessful attempts to organise the Wahbiang Tour this June holidays, a small group of us managed to find time for a small gathering in Hong Kong last weekend. 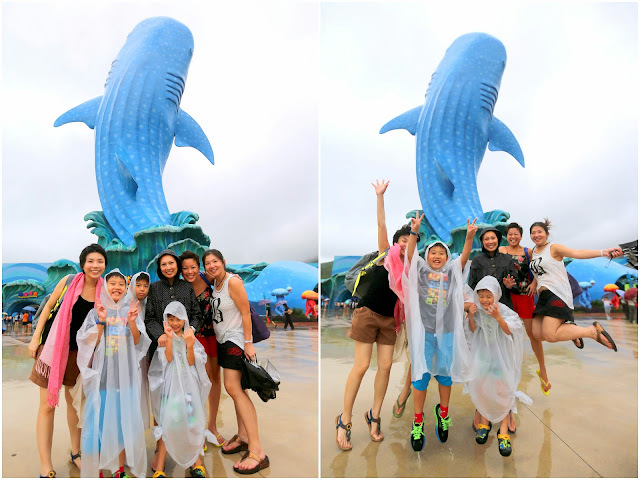 Juliana and Karen flew in with their boys and joined us for an arduous trip to the new Chimelong Ocean Kingdom at Zhuhai Hengqin (横琴长隆海洋王国). This was quite an unusual and unique travel group combination. It was an interesting traveling experience with the company of four tough women and three very mischievous boys. I was the only man in the group. I know how chaotic it can be whenever you travel with a group of naughty kids and tiger-mums. Knowing we have to take multiple transports and cross 2 cities to the final destination, I was prepared for the worst travel experience but this group proved me wrong. Everything was very smooth. Everyone was on time and there was no delay. The pace was fantastic and it was pretty enjoyable! Best of all, I got to know the kids and mothers better! 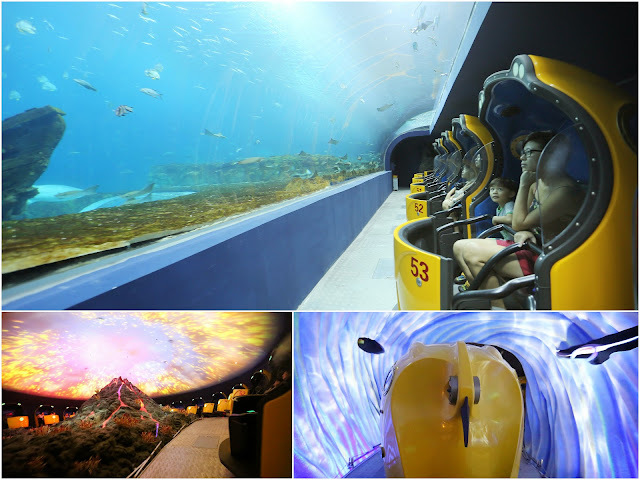 How to go to Zhuhai Chimelong Ocean Kingdom from Hong Kong / Macau – Heading out to the new attraction can be challenging. There was no direct ferry connecting Hong Kong to Zhuhai Hengqin Port (珠海横琴口岸). The most direct route would be taking a 75-min ferry (cost about HKD220/adult) from Hong Kong Macau Ferry Terminal (港澳碼頭) to Zhuhai Jiuzhou Port (珠海九洲港). 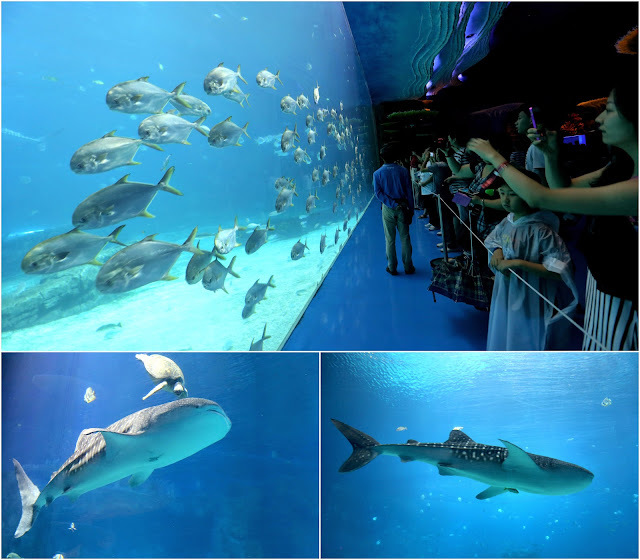 From Zhuhai Jiuzhou Port, take a 40-minute taxi (cost around RMB65-75) to Chimelong Ocean Kingdom. Using this route, the total cost for each pax is about HKD300. The whole journey takes about 115 minute. We took a cheaper and slightly shorter route. However, this route took us a total of 5 transfers, compared with only 2 transfers in the earlier option. First, we took a 60-minute ferry (cost about HKD185/adult) from Hong Kong Macau Ferry Terminal to Macau. From there, we took a free 15-minute shuttle bus to Venetian Hotel where we transferred to another free 5-minute shuttle bus to Lotus Port (莲花口岸). There was no queue at all at this Macau-Zhuhai border. The distance between these two border-checkpoints is about 1km and we paid HKD5/pax for a 5-minute border shuttle bus. At Zhuhai Hengqin Port (珠海横琴口岸), we took a 7-minute hotel bus (free if you have the hotel vouchers or if not it will cost only RMB8/pax) to the Chimelong Ocean Kingdom Hotel. There were taxis outside Zhuhai Hengqin Port and it cost RMB30/ride to the hotel. There are many guys asking you to hop on their cab, do negotiate the price. If unsure, ask the local custom police for help. Using this route, the total cost for each pax is only HKD225. The whole journey takes about 100 minute. 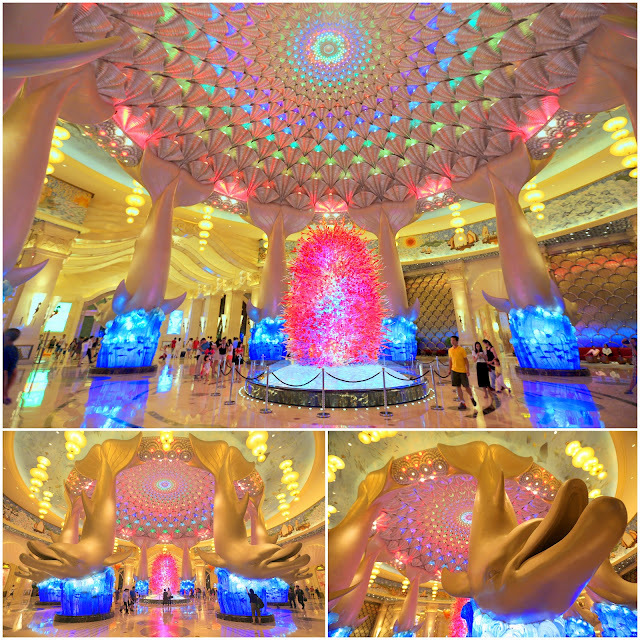 At the Zhuhai Hengqin Bay Hotel (横琴湾酒店), China’s largest ocean ecological theme hotel lobby intrigued us with its gigantic spectacular dolphin pillars. 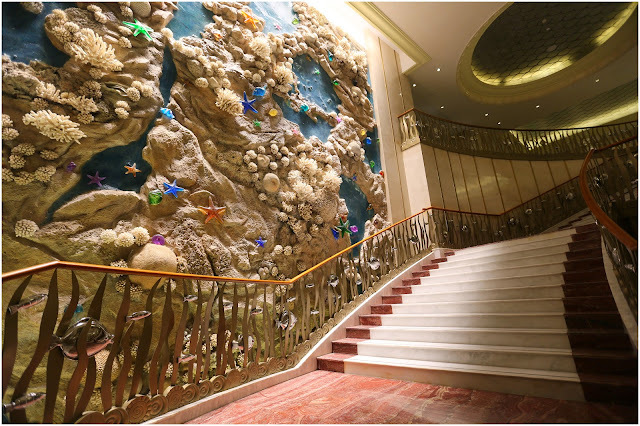 Houses over 1,800 spacious and luxurious suites and 4 big swimming pools, the hotel is connected to the Chimelong Ocean Kingdom by a 1,000m water canal. Visitors can take a private cruise from the hotel to the theme park. Despite the grand interiors, services and hotel standard, in my opinion, was only so-so. Check-in queue was long and it took me over 30 minutes to get my room cards. Food charges were rather costly and the quality was satisfactory. There were a couple of convenient shops in the hotel but the prices were 200-300% more than usual. There was little signage around the premise to guide you to the key locations in the hotel but the hotel staffs were at every turn to guide you. Swimming pools closed at 8:30pm and it was quite a distance to our rooms. The only thing we liked was the hotel room. It was really spacious, clean and the beds were very comfortable. 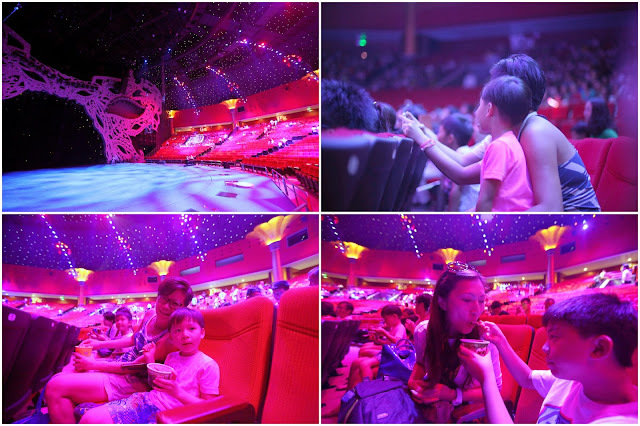 We decided to watch the Hengqin Chimelong International Circus (横琴长隆国际大马戏) on Saturday evening and visit the Chimelong Ocean Kingdom on Sunday morning. 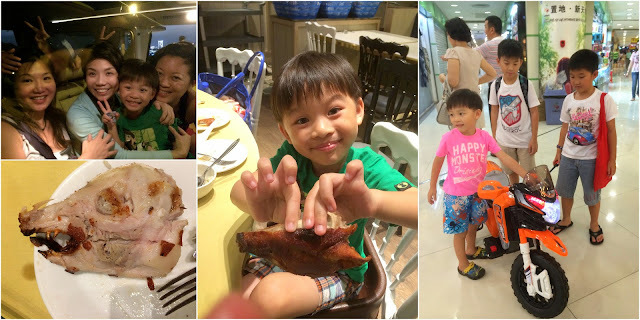 During our free time, I brought the ladies and boys to Gongbei Port (拱北口岸地下商场) for lunch and shopping. We bought so many things! Both ladies and kids loved it! The next morning, it was pouring cats and dogs. We were at the theme park entrance 10 minutes after its opening hour at 930am. 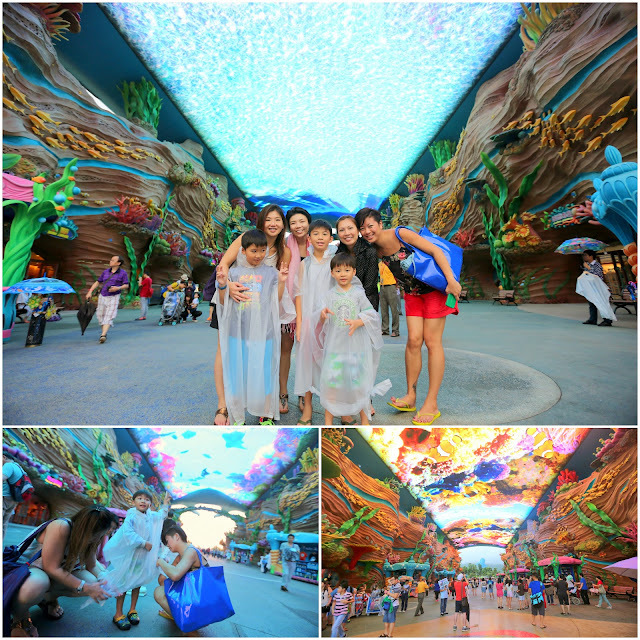 Despite the heavy downpour, there were thousands of visitors at the park! At the entrance, we were greeted by a gigantic “Manta Ray” LCD roof canopy. It was massively impressive! 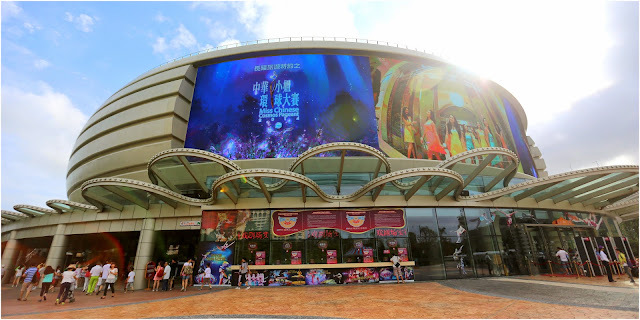 Officially opened in March 2014, the RMB20-billion 132-hectare theme park houses 8 different zones. 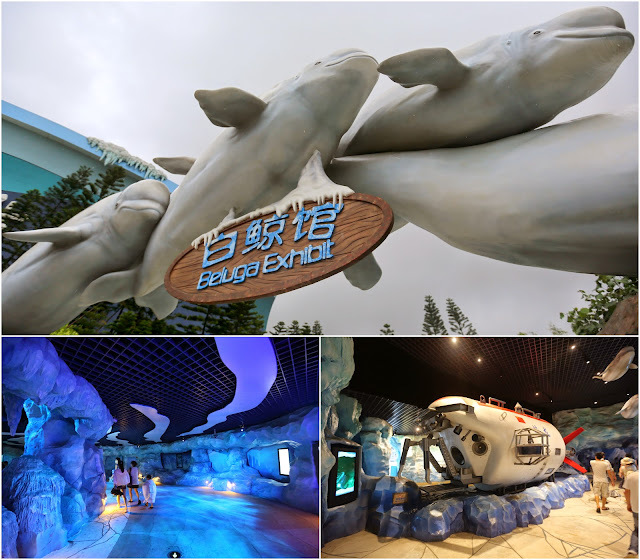 (Loop starting from the right: Ocean Main Street, Dolphin Cove, Amazing Amazon, Ocean Wonders, Polar Adventure, Colourful World, Mount Walrus and Hengqin Sea). Zoned in a circular format, it was very easy to navigate around the theme park – even without a map. At Dolphin Cove, we came face to face with bottle-nose dolphins in its underwater enclosures. Next stop at Amazing Amazon, Karen and Tracy took the park’s most scary roller-coaster ride, the Parrot Coaster. At a height of 50m, it is the third tallest ride in the world. Running at a distance of 1,278m, this is also the world’s longest and fastest “wing coaster” ride with a top speed of 108km/h. The girls didn’t know about all this fact before they queued up for it. All we knew was Tracy sprained her neck during the ride. The Ocean Wonders is majestic and record-breaking! 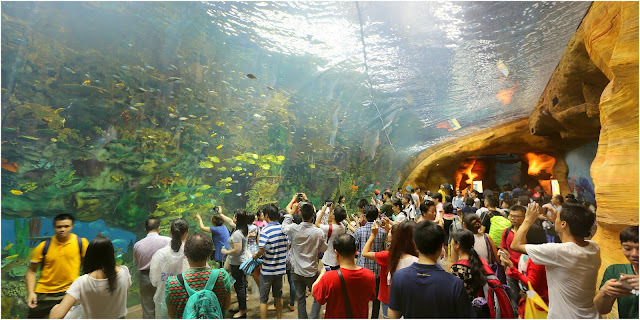 Here lies the world’s largest aquarium (yes, it topples the Singapore Sentosa’s record). 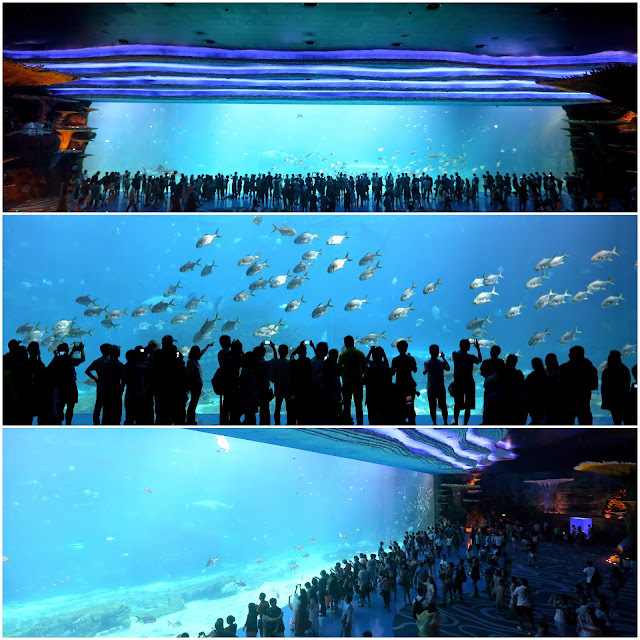 Boasting a total water volume of 12.87 million gallons, the attraction holds another 4 new world records for “Largest Underwater Viewing Dome, Largest Aquarium Tank, Largest Aquarium Window and Largest Acrylic Panel”! Impressive marvels! 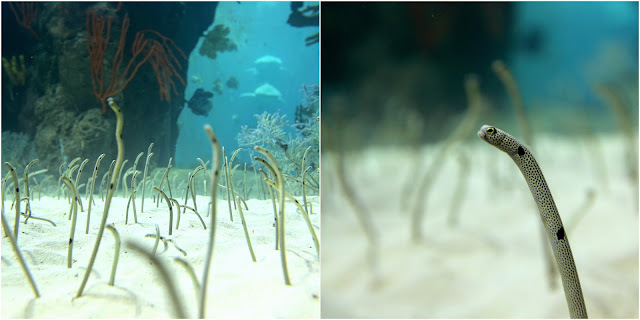 Here, we took a kid-friendly Deep Sea Odyssey ride. 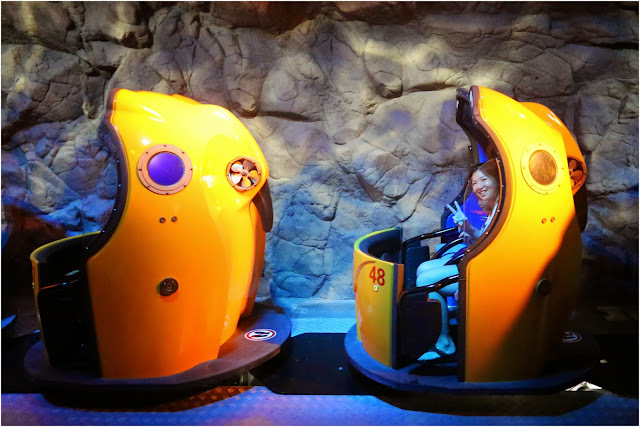 It is an unique 2-seater capsule ride that goes inside the aquarium and volcanic land. At Polar Adventure, temperature was at 10-14 degree Celsius. We were soaking wet and cold from the rain and we didn’t stay long in this enclosure. 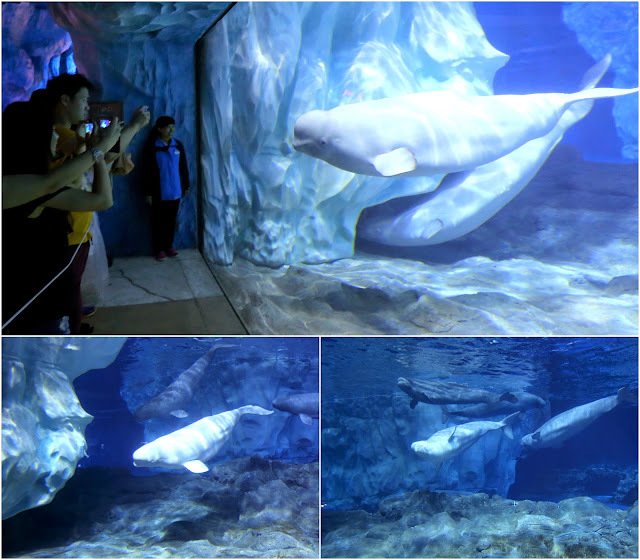 Here, we saw the beautiful Beluga whales and the polar bears. At 11am, we went to the Polar Theatre to catch the talented Beluga performance! 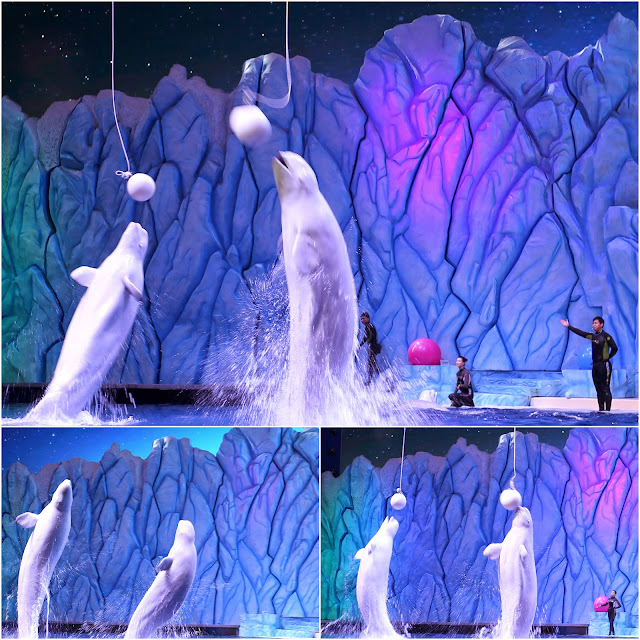 Like dolphins and orcas, the Beluga whales are very talented with an IQ of 6-year-old. 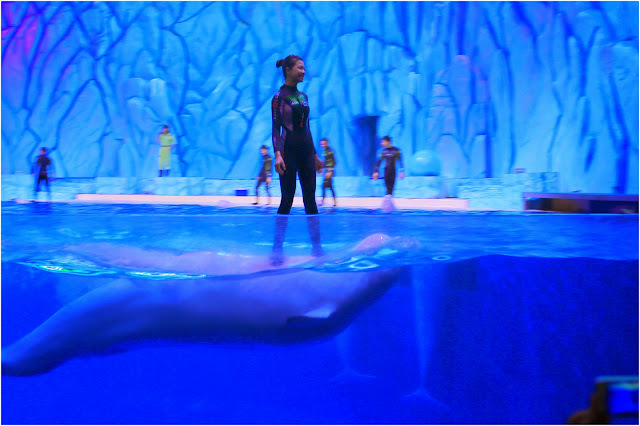 After the show, most of us felt sad for these peaceful mammals as they should be freed and belong in the wild. 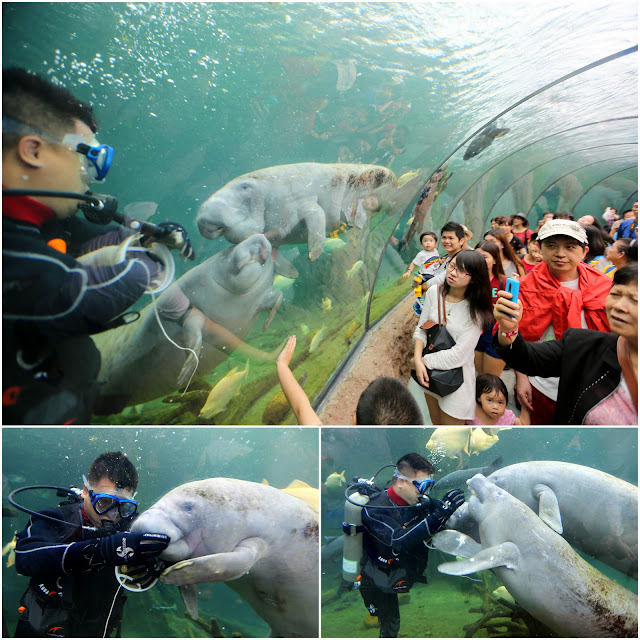 While it is a good enclosure for the kids to learn more about these magnificent creatures, there should be more sustainable model to house and protect the animals. Our last stop was at Mount Walrus (we skipped the Colourful World and Hengqin Sea). By then, the adults were fairly drenched and tired. 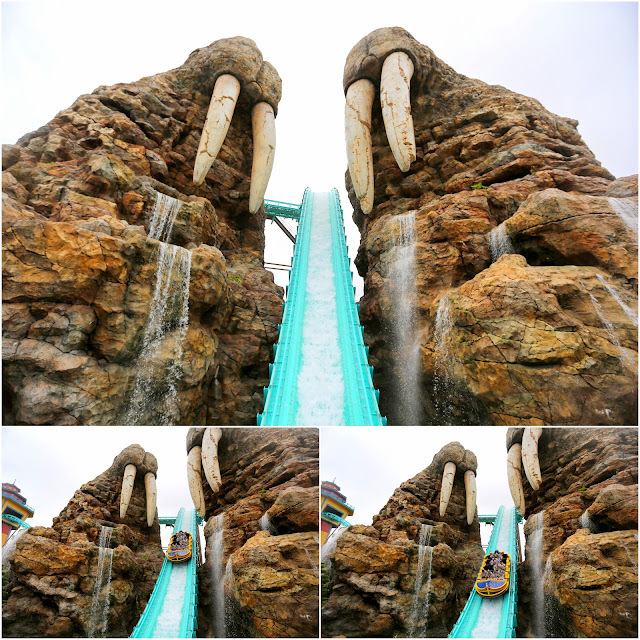 We contemplated at the Walrus Ride and in the end, we all decided to give this a miss. 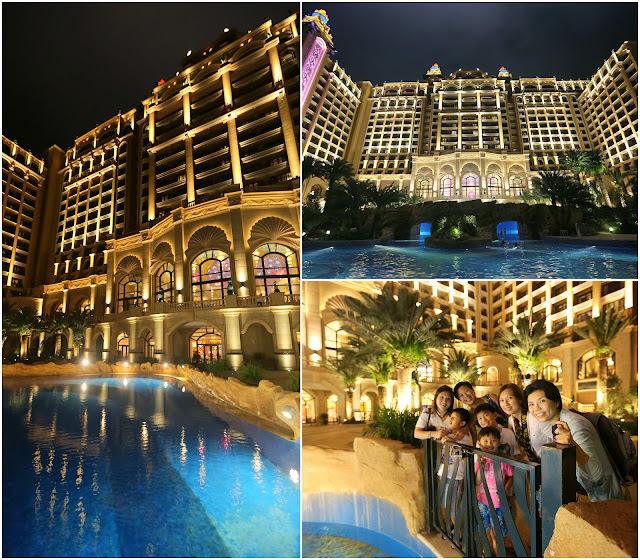 At 3pm, we left the theme park and made our way back to Macau for dinner and a few rounds at the casino. Like all Wahbiang gatherings, the trip with Karen and Juliana was an enjoyable one. After spending 2 solid days with the kids, I discovered new things about the kids. Zechariah isn’t a shy and gentle boy, he can be a very cheeky, active and adoring child. Alston and Elkan become good travel buddies and they share their toys and iPads. There weren’t any fighting among the kids, just the usual “catch and play” sessions. The ladies took turns to watch over the kids during the travel and shared parenting tips with one another. While the rest of the Wahbiang clan weren’t here, we talked a lot about them throughout the trip. This trip opened my eyes on future Wahbiang trips. As long as the parents are able to manage their own children and be very discipline in the timing, it is highly feasible to plan a trip with kids and adults. 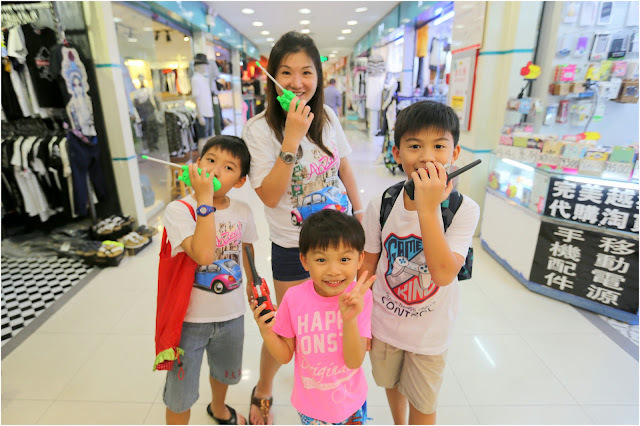 While it might be difficult for every adults and kids to bond with everyone, it is still a wholesome get-together session for the clan – as long as we know how to manage ourselves and learn to divide and conquer. Let’s plan for the next Wahbiang Trip soon. Looking back, the Perth trip is certainly ambitious but it is still possible. Let’s start with something small. Thanks Karen and Juliana (and kids) for the reunion and all the happy moments! Bet you ladies are well “China-trained” now! Hi, how about entering Hengqing border, does it require Chinese Visa? That depends where you are from? You have to check with your country. I would like to seek your kind advice on getting to Zhuhai Chimelong from hotel in Taipa. I have difficulty searching info on how to get through the Hengqin Port.Can I get a taxi to Hengqin Port from Taipa area?Roughly how long does it takes as I don’t have any idea about what time to start our journey.I’m traveling with my husband, parents and 4 years old kid. From your blog , you mentioned the distance between two border-checkpoints is about 1km and it costs HKD3/pax for a 5-minute border shuttle bus. Is it easy to get this shuttle bus?any specific counter or is there any other option like taking taxi? From Taipa area, you can take a taxi to “Lotus Custom” – pronounced as Lian Hua Ko An 莲花口岸 (which is the name of the port on Macau side). It takes around 10 minutes taxi from Venetian Hotel. There should be a free shuttle bus from Venetian Hotel to this custom. The shuttle service between the 2 customs will come every 10 minutes. So right after you get out of Macau Custom, you will find the shuttle bus right stand outside the custom. Wait for the bus to bring you across to China custom. It is a very short transit zone, no other external public transport between the 2 customs. I am flying to Macau. 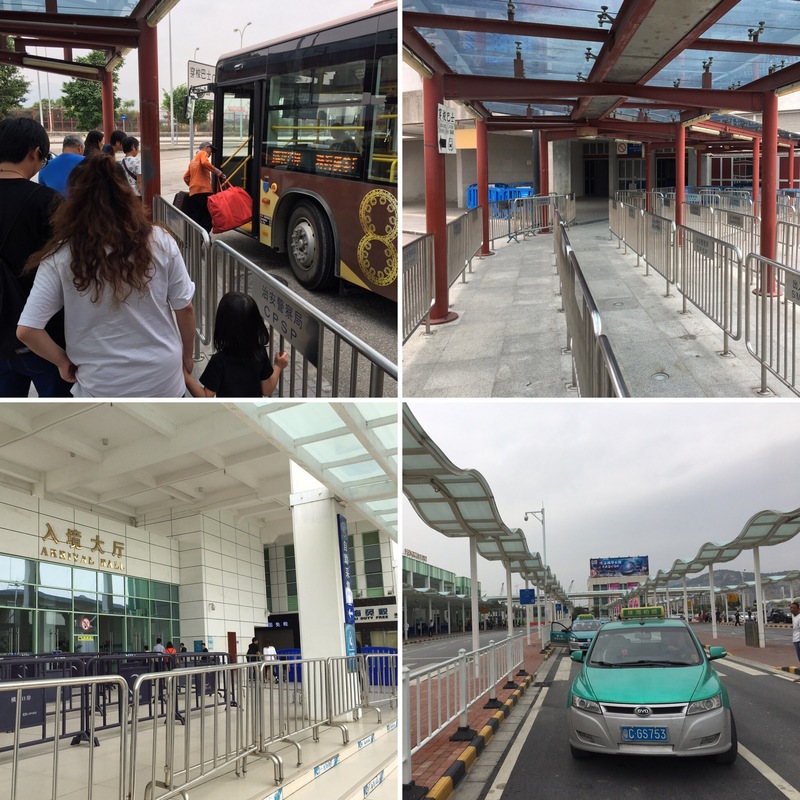 Do you know how to travel from Macau International airport to the Hengqin Hotel? The fastest way is to take a Macau cab (from Macau Airport) to Lotus Custom 莲花口岸 (on Macau side) and cross over to Hengqin Custom 珠海横琴口岸 (Zhuhai side). 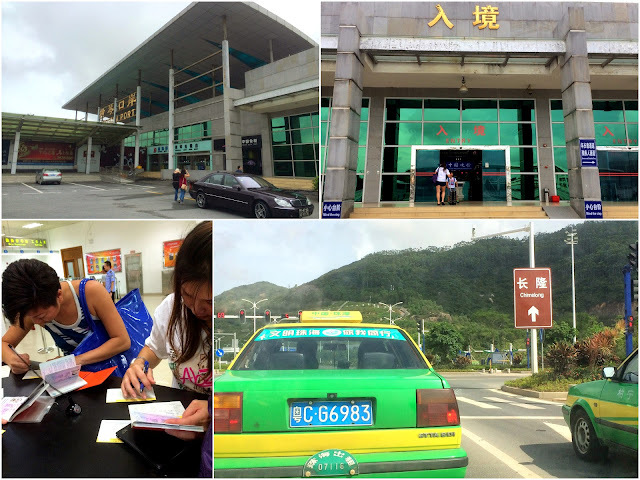 Once you cross into Zhuhai, there will be China cabs outside waiting. Beware of drivers who don’t charge by the meter. Reasonably, the ride should not be more than 50RMB. If not, you can wait for the Chimelong Bus. Another way if you like to save money but it means you will be dragging your luggage along and take you about 30min waiting for the buses. 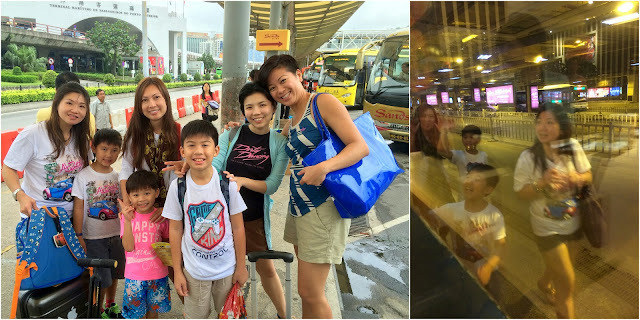 Hop on a free shuttle bus from the airport to Ventian Casino and from there, take another free shuttle to Lotus Port. Enjoy! On your way back, do visit the Sky-Shilla airport duty free shop to buy Macau exclusive products. Cheers! Understand that HK International Airport has a direct ferry to Zhuhai’s Jiuzhou port. We will probably take this option as we will be travelling to Zhuhai upon touching down in HKIA. In term of accommodation, I’m not sure which options is feasible. Please advise. Thanks! We will be staying in Zhuhai for 2 nights. 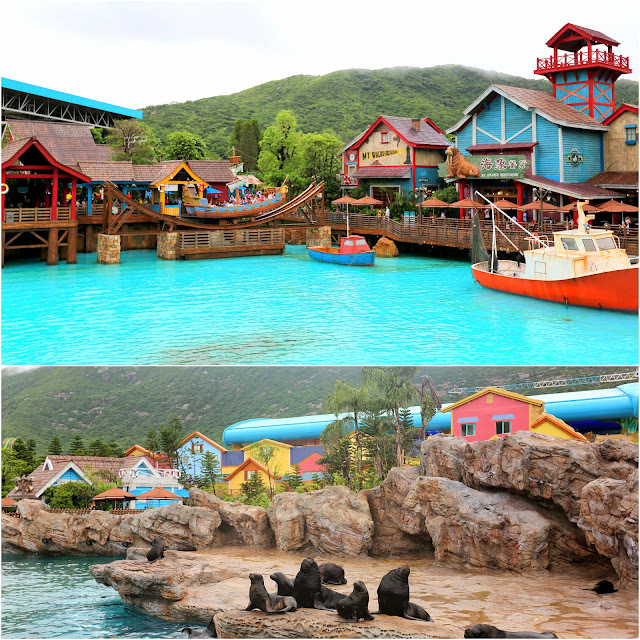 Day 1 will be F&E and Day 2 is for Chimelong Ocean Kingdom. I actually prefer option 2, however I’m not sure if we will be wasting time & money on travelling? Option 2 is the best option – as it is just in the heart of the shopping district and just beside Macau-Zhuhai (Gongbei Border). If you don’t mind the crowd and noise, option 2 is the best. Jiuzhou Port is only 15-minute ride away from Gongbei. Once you are at Jiuzhou Port, you can book ferry ticket back to Hong Kong (either Kowloon or Macau-Ferry Terminal on Hong Kong Island – depending where your HK hotel is). There is a taxi queue right outside Jiuzhou Port and there will also be “private drivers” offering rides. Ignore them as their cost is usually 100% more. A ride to Gongbei is about RMB25, the private driver will ask for RMB50 or more. Another good incentive to stay near to Gongbei is it is close to Macau and you can simply walk over to Macau. Or take a train to Guangzhou at Zhuhai Train Station. Traveling from Gongbei to Chimelong is about RMB60/trip (takes about 35 min). Each car can only take 4 passengers. So if you have more people, then you need 2 cabs. Hotel + food prices are more expensive at Chimelong as it is a touristy place (compared with those around Gongbei). At night, there is nothing around the resort so it is wise to be at Gongbei. The only advantage staying at Chimelong is logistic – if you are going there to swim, it is more convenient for you to change and get into swimming gears. Always bring rain-coat or umbrellas (as August is typhoon season). It can be either very hot or very rainy. Avoid the summer crowd by heading to the theme-park as early as possible (before 9am). Pace yourself around the park so you won’t miss all the animal shows. The shows are free-seating so it is wise to be waiting outside the show entrance at least 15 minutes before showtime. Drink more water and have fun! Travel safe! Thank you for your reply! Appreciate your time in this matter! In regards to the purchasing of ferry tickets back to HK, is it advisable to buy the tickets upon reaching jiuzhou port or can we purchase the tickets on the day we return for HK? Not sure if the tickets will be sold out if we purchase on the day itself. Summer crowd? You mean August is a peak season in china? Will it be very very very crowded? There are 8 of us travelling together and im afraid we might not be able to finish the theme park in one day. It is better to get the tickets first the moment you arrive as it is peak travel season in Aug (and especially over weekends). You can certainly finish the theme-park in day unless you want to take every ride. Depending on your budget, there are “Speed-Pass” tickets that cost over 100% more, but it cut queuing time a lot. If there are 8 of you, it might be worth to get into private SUV. But always inspect the car first before following the driver cos’ some of the “promised SUV” is actually an old makeshift van. Always pick a newer car. The themepark offers night circus. 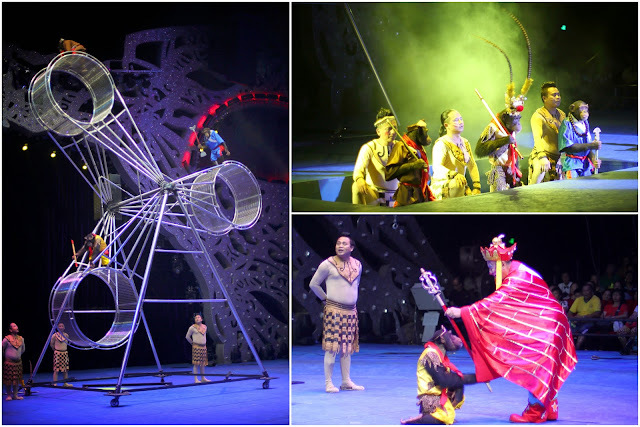 You may skip that cos’ I don’t find that very fascinating (compared with the original Chimelong Circus at Guangzhou). 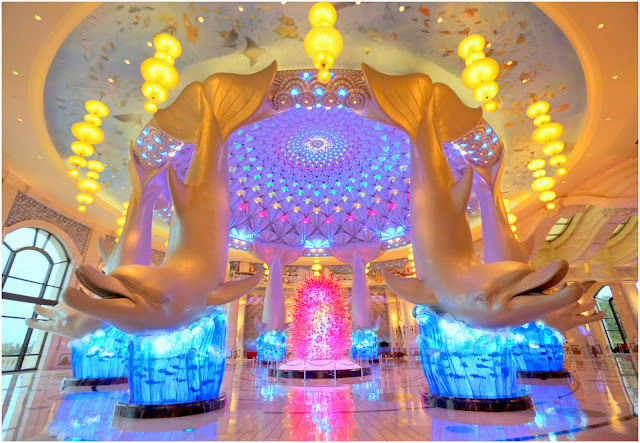 The Chimelong hotel lobby is photographic spot with the overarching dolphins in the great hall. Noted! Thank you for advice!!! I will be going to chimelong this Nov and staying a night at the Da HengQin superior talent hotel which is half way between chimelong and zhuhai port. Please advise is taxi easily available at chimelong ocean kingdom for me to take a ride back to the hotel after the visiting the park at 8pm. Yes. It is relatively easy to get a cab back to Zhuhai Port. However, it might be a little difficult to grab a cab right after the circus. You can always head to the Chimelong hotel and get a cab back to the hotel. The service staffs in the lobby can assist you. Nowadays, the local Chinese also use Didi Cab App (like Uber) to call for cabs, pretty efficient. Enjoy your stay! 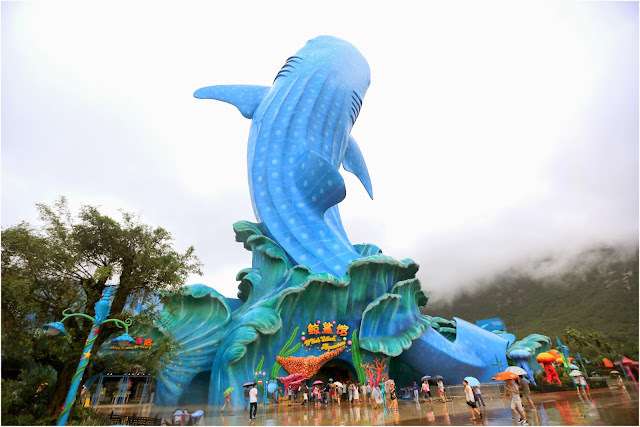 hi, i am planning to travel to the zhuhai chimelong ocean kingdom in jul. it will be me, my husband n my 2-year old, wld it be better to stay in the ocean kingdom’s hotel or hotels located outside of the ocean kingdom? is the place pram friendly? we will not be taking any of those fancy rides in the ovean kingdom, so can the park be covered in 1 day? thk u. Be prepared for extreme hot weather and lots of tourists if you are heading there in July. The park is pram friendly but you will find yourself stuck in long queues and congestion. 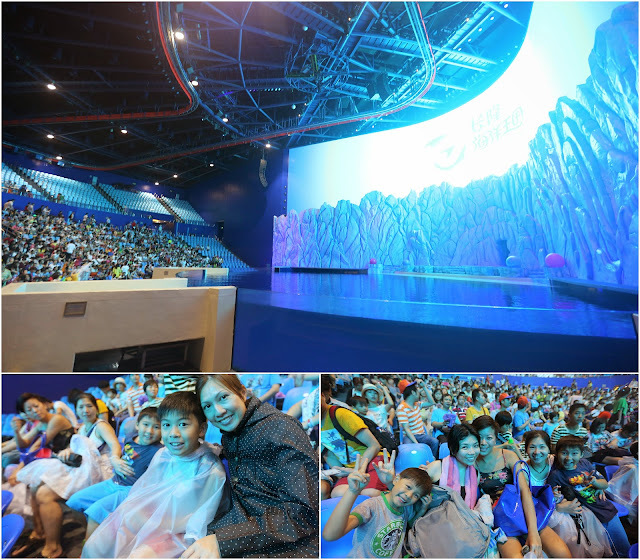 The underwater aquariums are mainly indoor and air-conditioned so it will be comfortable for your family. Given that you have a 2-year old child, I would say it will be more convenient for you to stay in the hotel so you will have less taxi transfer to the city. 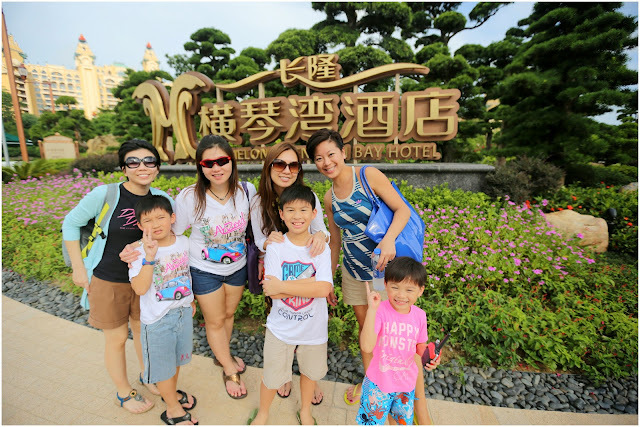 How do you travel from Zhuhai hengqin bay hotel to Gongbei port for shopping? It is possible to finish the park in just one day as it is a small group. But you have to be there at 9am and beat the queue for those thrilling rides. For tickets price, you might want to go to the official site to check their latest promotion price. One tip for you is to record down all the animal shows timing so you can plan your tour more efficiently. For hotel, that depends on what you and your wife enjoy. If you want a quiet and hassle-free stay, you can park yourself wholly inside the resort so you avoid travel to and fro the resort and city hotel. You can spend time exploring the hotel facilities (like the pool and garden). Sept Mid Autumn Festival would be hot and humid. It won’t be as crowded during the summer holidays like Jul-Sept. But the heat might slow your pace. Taxi fare from city hotel to the resort ranges between 90-120rmb (40mins). It is not far really. The advantage of staying in the city is the shopping, massage and food. The resort food is so so and expensive. 1) Xin Hai Li Hotel – there is a nice spa and food street behind. Gongbei shopping district is just nearby. Make sure you book the new wing, room is bigger and newer. 2) Zoban Art Hotel – located opposite the sea, quiet and cozy boutique hotel. Please review the hotel photos at booking.com or CTrip before booking. Thank you very much for your kind advice. My wife and I appreciate your precious time taken in response to our enquiry. I read your blog and learnt that it is advisable to stay in the Zhuhai city than the resort. May I know any recommendation for the hotel and how much it cost ?Also how much is the entrance fee to the ocean kingdom ? Does it offer any two days pass if I wish to visit in two days? Or can we finish all the attraction in one day? What is the taxi fare from the ocean kingdom to the city hotel? I am planning to go in September 2015 And that is the Mid Autumn festival period will it be crowded in the resort ? thank you very much for your kind response. Thanks for writing in. Just before I answer your questions, may I know the profile of your travel group? There will be difference if you are traveling in big group with elders / young children or as young couples etc. Hotel at Chimelong is about 1,200RMB per night and food at the resort cost easily about 150 per pax per meal. 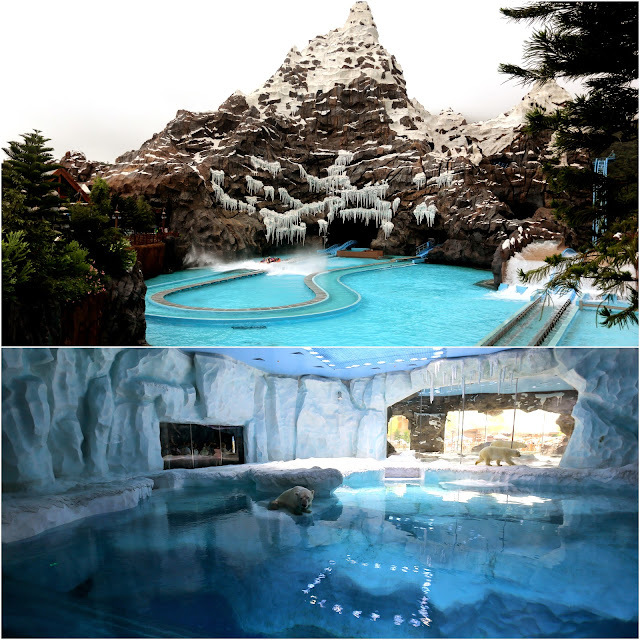 I would recommend you to stay outside the resort as it will be cold and you wont be using the hotel outdoot facilities. Taxi to the resort cost about 120RMB per trip (20-30 mins ride). There are more things outside the resort too. Hotel around Zhuhai cost about 500RMB/night. Food outside the resort – are certainly much cheaper. Check out the hotel photos at booking.com or C-trip website. I’m planning to go to Chimelong Hotel from HK for a day tour. Which route would you recommend? I can’t read and speak Chinese so I prefer the less complicated route. Thank you! Take a 1.15hr ferry from HK-Macau Terminal (at Central) to Zhuhai Jiuzhuo Port. From Jiuzhuo Port, take a 40min cab to Chimelong Hotel. It cost about 80Rmb per trip. Remember to take cabs from the taxi queue. There will be drivers offering to take you there just outside the port terminal, avoid them as they charge up to 150-200rmb for the trip. To enjoy all the attractions, it takes about 7-hour! So plan your time well! May be wise to stay overnight if you want a relaxing trip. Do pre-book a return ticket if you plan a day-trip only. Do book the ferry tickets in advance. Make sure you have China visa covered if you are a foreigner. Thank you for the quick response and recommendations. Do ferry tickets get sold out fast? Is there an immigration at Jiuzhou or I have to go to Gongbei? Read your post about the HK-Macau-Hengqin route. I was interested to take that at first but might be difficult for foreigners. Glad you got my message eventually. The Zoo is quite easy to navigate around and it is worth taking the Day-Safari Tram. Both walking track and tram track are different. When walking, you are looking at the animals with barriers. When on the tram, you are actually entering the open safari where animals roam freely. Remember to sit at the side of the tram (and not in the middle) for better photography-view. The 2 entrances of the zoo are located at 2 ends. So, you walk from one entrance to another. You can enter from either one of the 2 entrances. The tram ride is located at one of the entrance. Depending on which entrance you enter, you take the ride (so you need not to U-turn to take the ride later). I would say leave the tram to the last as you would be tired after walking and take a nice cozy tram in the evening when the animals are more active too. In the day (under the hot sun), most of the animals will be hiding under the shade. 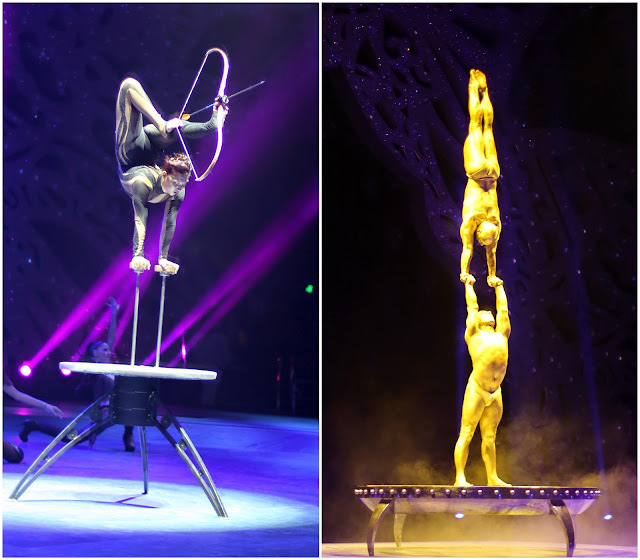 Last points – Both Chimelongs (be it Safari or OceanWorld) offer circus. 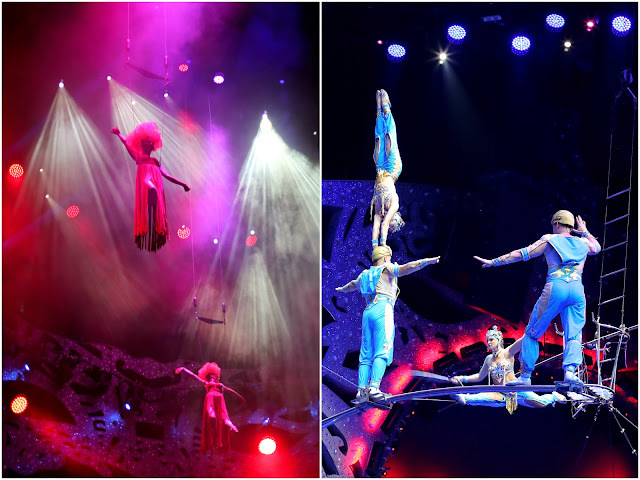 If you want to view the circus, see the one at Guangzhou as it is more exciting and interesting. I don’t really enjoy the one at Zhuhai. Thank you for the insight. Good point on sitting positions and the tram timing. Appreciate it so much. I want to visit Chimelong Ocean Kingdom.but i have a question: do you know if it is possible to take a visa in lotus porto(border)? Thank s !! Yes, it is a big Chinese custom. If you can apply a visa at Shenzhen border, I am sure you can at Lotus. 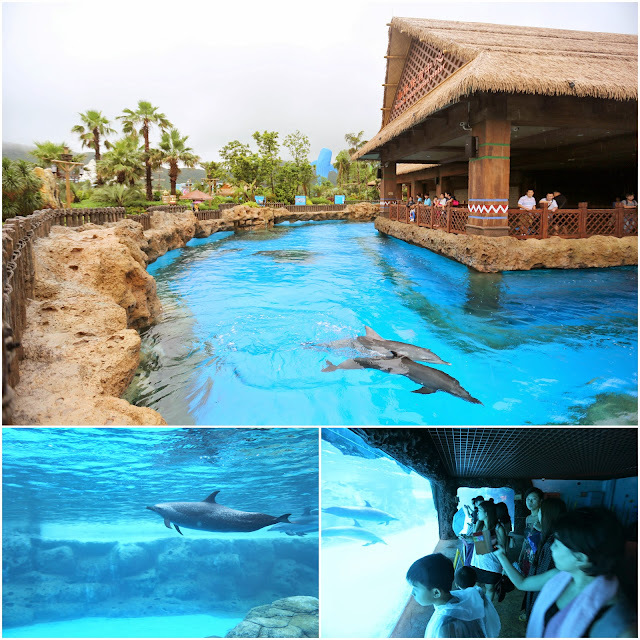 Your travel plan from HongKong to Ocean Kingdom was some of the crucial information needed to plan my trip as well. I am from Malaysia and my 4yr old daughter loves the zoo and huge aquariums. 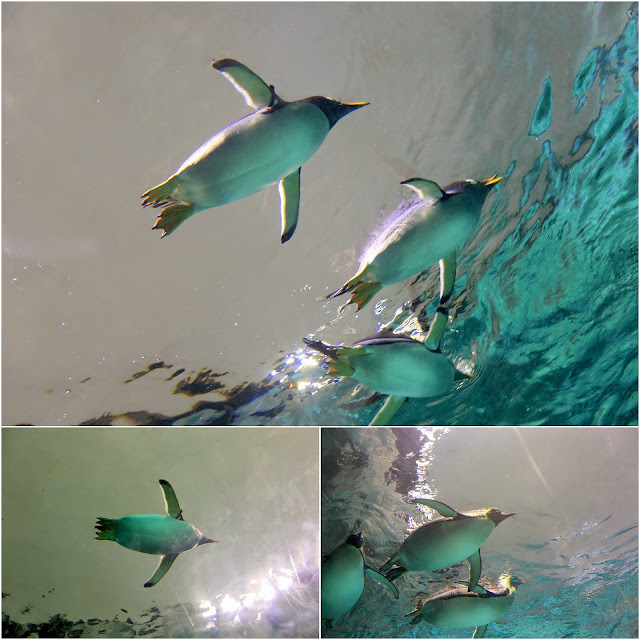 I went to the Singapore Zoo and Aquarium for the past two years. I might go again if my China plans fail this year. 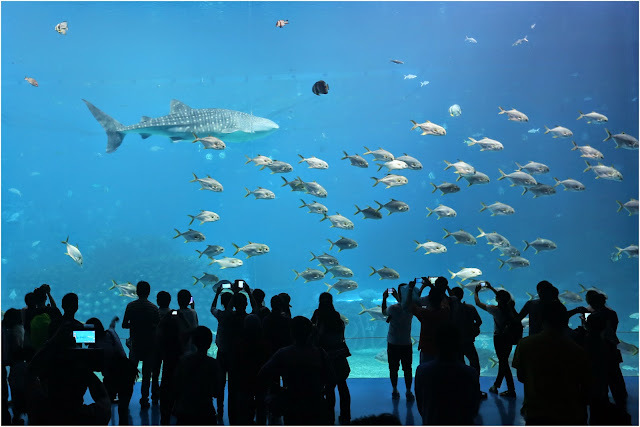 I am deciding to look for whale sharks within Asia, even though I am not a fan of them in captivity, I can only let my daughter see them through a glass window for now. There is Okinawa, Osaka, Taipei, and then I found this place, Ocean Kingdom in Zhuhai and as you pointed out, 5 Guiness world records!!!!.. Crazy feat accomplished !!!.. 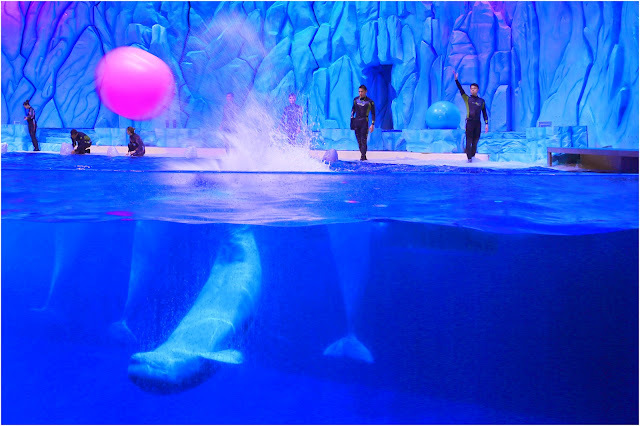 There is this two killer whales which Russia caught and said to be sold to China.. Assumptions are they are training them to be shown in Ocean Kingdom.. Since Im going to the GuangZhou area, I am also thinking to head up to Puyan to checkout the ChimeLong Safari Park, Grizzly bears, Pandas… That is another must see places for my daughter. Currently I am going through some English friendly websites/tours that can get me some package plans. However, I would love the free an easy option and adventure my way through China with smiles and sign languages :p… your trip was a big part of my adventure yet to come.. Thanks again !! Fly to HK.. then to Macau then to Lotus Port then to Zhuhai, finally landing me at Ocean Kindgom.. I am still working through google translate to see how to travel from there up to Safari Park, Puyan… then to an airport… I really want to try their train system..
I’m happy that my blog helped you in your travel planning. 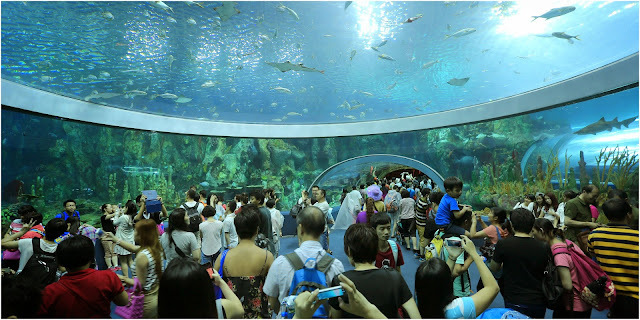 Avoid Osaka Aquarium as it is old and much smaller than the Hengqin Zhuhai. 3) Take a free Chimelong 30-min Transfer Shuttle Bus to Chimelong Guangzhou (or you may take a taxi for about RMB60-70/trip) – The Safari and Circus are just around the hotel. 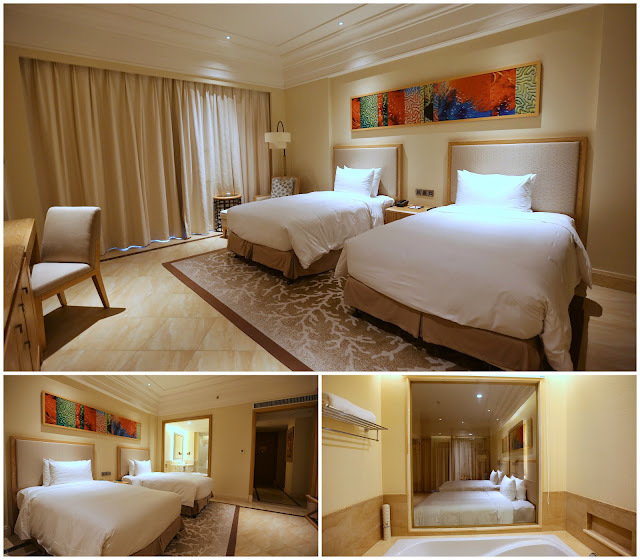 Depending on your travel needs, you can stay in a Guangzhou city hotel so you can tour around Guangzhou. Panyu is slightly away from the city. Initially I have summed up a route plan almost similiar to your advised plan, but I got a real shocker when I realised about the Golden week Festival. My trip is right smack on those dates. 13th – Safari Park with their metro line. Can you tell me about the Safari Park you went with ya dad, it was 3hrs of walking and a trem ride ?. I know it is really huge, and has two entrances. Which is the best way to enjoy the zoo ?. Some say go for the trem ride first, some say otherwise, what say you ?